Most Americans only seem to know Indonesia as one of the places President Obama mentions in his books as a place he grew up as a child. And much like Obama portrayed it in his book 'Dreams From My Father', Americans seem to picture it as a picturesque country... all be it developing at best. We tend not to be informed about the history of genocide that pot-marks Indonesian history. And very few Americans can even name the man that comes across as the Indonesian version of Hitler or Stalin. Sadly our government did and has always known about the history of genocide within Indonesia and East Timor. President after president has taken the time to fly out to Indonesia and pat the blood thirsty dictator on the back for his "hard work" developing the country. Not a single one even seemed bothered by the estimated 1.5 million dead that the tyrant racked up over his life time. So on January 27th, 2008 one can only imagine that newly elected President Barack Obama may have been disappointed that he would not join the long list of presidents to pat General Suharto on the back. That day the monster the US had backed finally died. Through old age, Suharto evaded justice and escaped punishment for the millions of deaths he had ordered and committed. 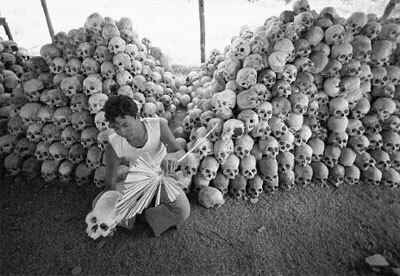 So how culpable is the United States in the genocides that occurred on General Suharto's watch? After the Timorese people gained their independence from the colonial rule of Portugal they found themselves moving away from American interest and towards communism as a means of coping with the power vacuum that followed liberation. This thorn in the American's fight against "the domino affect" was immediately identified by Washington DC with help of CIA and military intelligence services in the area. The desire to "fix" the situation in East Timor became the fixation of then President Ford. In reality, which is often contrary to Washington's version, East Timor was deeply divided between the right leaning Timorese Democratic Union party and the leftist Fretilin (Revolutionary Front of Independent East Timor) party. This political divide was only tipped into civil war when Indonesian and US propaganda and rumor drove the wedge till the Timor split. Thus the excuse for "solving the problem" was created. Indonesia, unlike America, was motivated to interfere with Timorese self-governance due to both nationalism and expansionist race theory. Much like Hitler's Nazi Germany, Suharto's Indonesia felt that the only way to grow their society was to steal both land and resources from lesser races. This was an ethnocentric belief that had been fueled by Suharto's own government and the cultural history of the ethnic groups that built up the Indonesian archipelago. On December 7th, 1975 Indonesia launched Operation Lotus as it invaded East Timor. The death toll that would follow was horrific. To gain control over villages and cities the Indonesian military was ordered to annihilate all resistance and "clean house" of all potential threats. In modern terms this was a "scorched earth" policy in which the invader used total warfare to crush it's opponents and victims alike. ~ Timor Radio Broadcast as the invasion began. 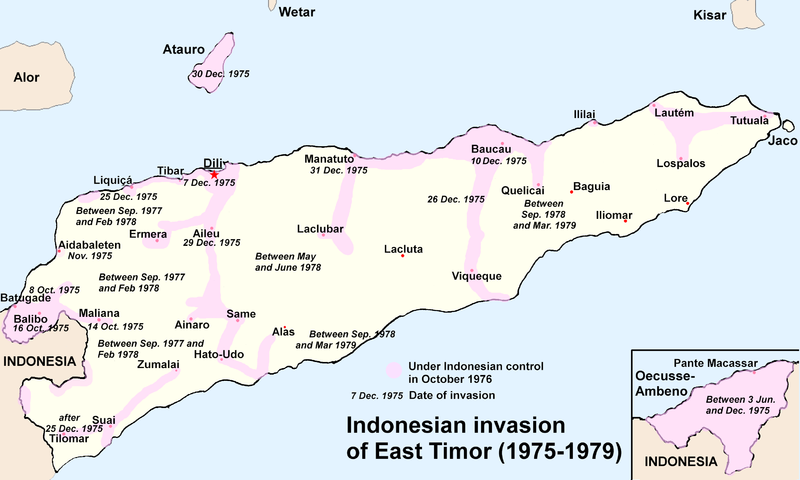 Over the entire length of the invasion the Indonesian military was unable to maintain and or control all key points throughout East Timor. The main reason was the devotion of Timorese resistance fighters and the FALINTIL soldiers who waged conventional and guerrilla warfare against the invading army. These brave soldiers fought tooth and nail to keep Indonesian soldiers from committing countless mass executions and rapes. However, no matter how hard the Timorese forces fought, they could not save everyone. 200,000 Timorese were killed in the invasion out of a total population of 600,000 prior to Suharto's invasion. The shear number of dead was staggering when one factors in just how ill equipped Indonesia was prior to US and English involvement and armament of Indonesian troops. These figures (provided by Amnesty International) include deaths from military action, massacre, starvation, deaths in Indonesian concentration camps, and those who died from disease due to Indonesian policy and actions during the invasion. So just how much did the United States back the invasion of East Timor? ~ Christopher Hitchens in "The Accidental President" published in the 'Mirror'. As early as March of 1975 the United States was already planning what to do about the Indonesian invasion of East Timor. The United States Ambassador to Indonesia, David Newsom recommended to Secretary of State Henry Kissinger that the United States use a "policy of silence" while dealing with General Suharto. This recommendation was nine months ahead of the invasion. It was agreed upon no later than eight months prior to Indonesia's invasion of East Timor. And it became White House policy more than half a year prior to this portion of Suharto's genocidal legacy. 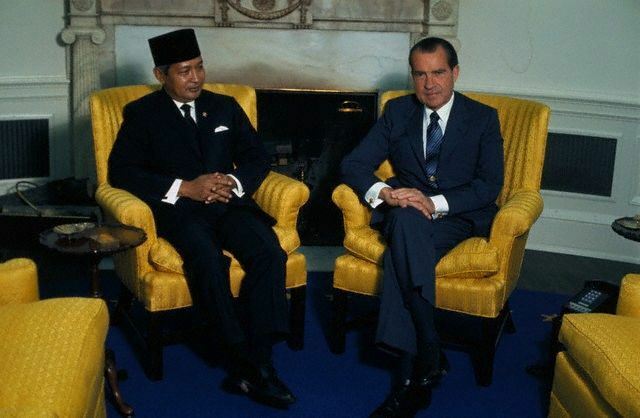 On the day of the invasion both President Ford and Secretary of State Henry Kissinger met with Indonesian President Suharto. 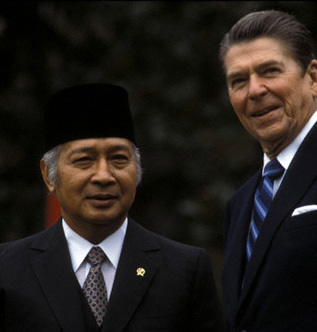 Ford was clear with Suharto in pointing out that the United States could not put "boots on the ground" due to its embarrassing defeat in Vietnam. On the other hand Ford was forthcoming with his support for Suharto's invasion and the massacres that followed. Both Ford and Kissinger assured Suharto that the United States would supply any form of military support they could without actually pulling the trigger or putting American lives in harm's way. "We want your understanding if it was deemed necessary to take rapid or drastic action [in East Timor]," President Ford. "We will understand and not press you on the issue. We understand the problem and the intentions you have." For the most part the United States had thrown its weight behind the Indonesian military with hopes that the invasion would be "swift" and without any real resistance. This meant that Ford's regime would need to supply the best weapons and ammunition that the United States could afford to hand over to a dictator. And yet at the same time the United States needed to make sure that US built weapons were not found in the hands of murderers should the invasion turn into a prolonged bloodbath. "It is important that whatever you do succeeds quickly," Kissinger directing Suharto. To assure this the United States handed over everything from destroyer escorts that were used to shell Timor coastal villages, the landing crafts that Indonesian troops came ashore on, the C-47s and C-130s from which Indonesian paratroopers dropped from, to the M-16s the Indonesian soldiers carried and the 50 caliber machine guns that supported them. US military personnel trained the Indonesian paratroopers on how to jump and where to jump in at. US navy officials were brought in to train Indonesian navy personnel on how to land the landing craft and where they could be brought ashore. In short... Ford spared nothing in his support of Suharto's bloody invasion. In total, the United State's backing of the invasion is often said to have amounted to an estimated $250 million dollars stretching from 1975 to 1979. This figure is only as trust worthy as the government that gave it however. "I probably have a lot of blood on my hands, but that’s not all bad." In 1949 West Papua found itself the subject of fierce debate and a pawn in a hate filled rivalry between the colonized and the colonizer. Once Indonesia was granted its freedom from the Dutch it immediately set its eyes upon New Guinea. However the Dutch claimed that the area of West Papua was a distinct geographical area that was both culturally and ethnically different than that of Indonesia. The results of this feud live on into present day. The West Papua people formed their own flag, national anthem, and country's name before the Dutch left for good. The Netherlands noted that "West New Guinea" was clearly forming a national identity. They were beginning to thrive in ways that Indonesia have not yet accomplished as an already established country in its own right. Suharto came to power in 1965 and after killing nearly 500,000 of his own countrymen he set his eyes upon West Papua. Indonesia had already begun small scale incursions into West Papua with backing of the United States. Suharto was determined to consolidate his power by increasing the size and severity of these incursions and ultimately the total invasion of West Papua. The Dutch stepped in one last time in the August of 1962 by forcing Indonesia before the UN. The disagreement over the fate of West Papua was carried out between the Netherlands and the Indonesians with the UN acting as mediator. The citizens of West Papua however were excluded from the decision that followed. The 'New York Agreement' was the hammer that sealed the coffin for hundreds of thousands of Papuans. This agreement allowed the UN to maintain control of West Papua for a short period of time before handing the reigns of governance over to Indonesia. By the end of 1969 the fate of West Papua was sealed. Throughout the time that the UN was said to be in control of West Papua General Suharto's military encroached upon the already limited freedoms that West Papuans had. Brutal forms of torture were employed to make the outside world believe that Papuans wanted to be part of Indonesia. Countless lives were lost as Suharto's silent genocide got under way. In 1969 the UN committed the execution of West Papua before the world. The UN announced a rigged election they called "Act Of Free Choice". This election allowed Suharto to handpick 1,000 West Papuans to vote as they were told under duress and often at gun point. No one was truly surprised when West Papua was declared to have voted unanimously in favor of becoming part of Indonesia. The UN, with direction of the United States, had allowed Suharto to invade West Papua without the need to use all out military force. All throughout the UN's involvement in West Papua's "free state" period the UN observers sent to monitor the situation had complained about Suharto's military presence within West Papua. Countless times these very UN observers had sent complaints back to New York telling of Indonesian troops restricting UN movement within West Papua. When word of atrocities spread the UN was unable to investigate due to Suharto's policy of confinement when it came to UN personnel. This campaign of committing war crimes behind the scenes had gone on all the way since 1962 till the 1969 vote. Dutch Report regarding West Papua upon the end of Dutch rule in 1961, "the first signs of the violent action taken by the Indonesian military, which would also characterize the new administration in the coming decades, soon appeared. Rapid impoverishment ensued, together with a substantial decline in legal certainty and a loss of civil rights across the board." Once the UN was officially gone after the vote in 1969 Suharto declared West Papua as a "military operations zone". 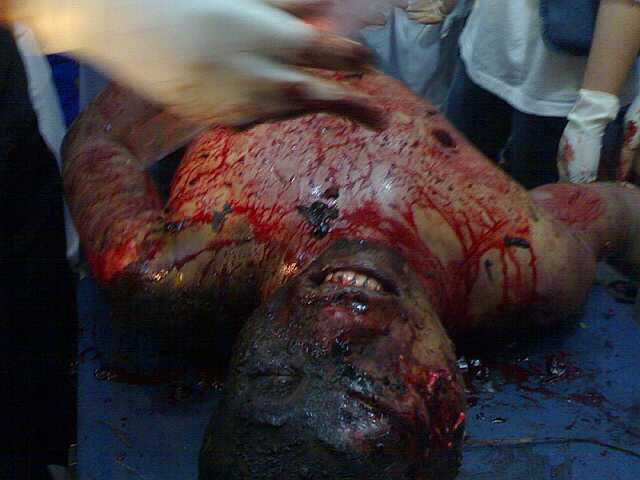 This allowed the Indonesian military full authority over West Papua and free reign over its unarmed population. Suharto's atrocities would go almost completely unnoticed in West Papua due to the restrictions that came with this declaration. 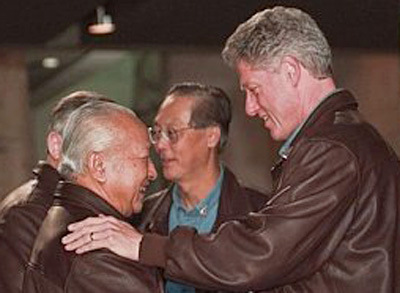 In 1998 the "occupation" era of Indonesia's military presence was said to have officially ended with the overthrow of Suharto and his military regime in Indonesia. 100,000 Papuans were estimated to have died during the military occupation period that stretched from 1969 to 1998. This is once again out of a total population of 800,000 prior to the occupation. It does not include the 30,000 Papuans that were estimated to had been killed from 1963 to 1969. "In the three years since [Suharto] fell ... a broad, civilian-based Papuan independence movement has emerged along side the guerrilla fighters and, for the first time, poses a serious challenge for Indonesia"
Suharto's legacy lives on in the way Indonesia deals with the "Free West Papua" movement. The movement had it's roots in the armed resistance by the same name that started in 1965. However the influx of common civilians into the guerrilla movement took shape almost immediately after Suharto fell from power in 1998. This movement has sparked the continuation of Suharto's policies across the board in Indonesian government. In 2003 Indonesia took Suharto's plans further by parceling out West Papua and dividing it up into three new territories. Their actions were based off the same philosophies the United States used to deal with Native American tribes across America. This action has helped to deprive West Papua of its unity and separate Papuans from one another. So just how big of a role has America played in the West Papua genocide? In 2003 the Indonesian government launched a military operation meant to spread terror and disperse Papuans from the highlands. 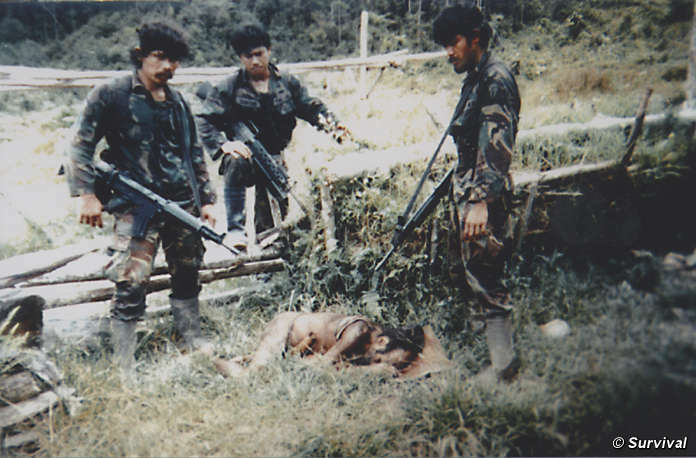 The actions taken by Indonesian troops included raids, rapes, countless murders, and the burning and looting of countless villages. Like so many of Indonesia's military campaigns, this one clearly was committed with American interest in mind. Freeport McMoran, a US company, operates a mine in the region where the bulk of the raids took place. Most of the violence was also linked to "security" payments the company pays to Indonesian military and police authorities. According to Vanuatu-based West Papuan People's Representative Office, "The presence of Freeport McMoran in West Papua has not brought any appreciable benefits to the people ... Instead, the exploitation of the mine has wrought serious damage to the local culture, belief system, environment, social structure and political aspirations of the people ... Freeport also promotes violence in the immediate region by providing funds in the millions of US dollars to the Indonesian military and security forces to maintain 'security' over the mine area, beside the US$1 billion as annual dividend, paid last year to the Indonesian Government." This is just one of many cases that show that unlike East Timor, in West Papua both American economics and politics play a role in supporting Indonesian policies of genocide and ethnic cleansing. Of course this is only accented by the same military sponsorship given to Indonesia in West Papua as was given to Suharto in his campaign in East Timor. The main difference between East Timor and West Papua is that the genocide in West Papua is still ongoing. This also unfortunately means that American support (both government based and civilian based) continues as well. Leaving Alder's Ledge to ask just how America could ever justify the deaths of an estimated 1.5 million at the hands of Indonesia's government over the lives of oppressed West Papuans to this day? Is it not time that the United States admit it's own past with genocide, it's involvement in foreign genocides, and it's complacency with ongoing genocides? Can we not move beyond our own selfishness and start righting the numerous wrongs these actions have led to? 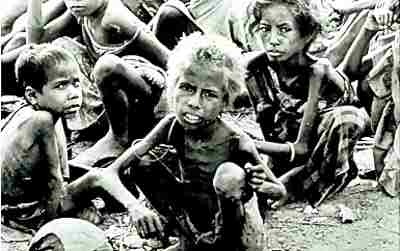 Or will the United States continue to back genocidal regimes like that of Indonesia and Burma?